It's a familiar theme - the inquiry is running behind schedule again, and yes, Mr Hutchinson will have to return for a third Q&A session. "I suspect Mr Hutchinson has something rather more attractive to do on a Friday morning than attend before the inquiry," says Sir Patrick. There's no sitting scheduled for next week, but an extra session has been pencilled in for 18 December. We're going to get our skis on soon and head for home down the snowy slopes of Stormont! An administration board to control the RHI scheme was to be set up involving DETI and the administrator Ofgem, and that would've had important responsibilities on keeping a handle on how the scheme operated. It was to meet on a regular basis, monitor "key risks" and make adjustments to the scheme to keep its costs under control... but it never materialised. Mr Hutchinson says he doesn't know why, but it might've be because there was such a low number of applications to the scheme in the first three months that it didn't seem necessary. "Whenever you don't establish something in the early days it's maybe harder to establish it later on," he adds, saying that there were "other things going on". Sir Patrick suggests that the proposal simply "disappeared", which Mr Hutchinson accepts was the case. People who engaged in the public consultation were not told that there were two broad options under consideration for what form the RHI scheme would take, says Mr Hutchinson. Mr Lunny asks whether it was ever outlined that an up-front grants fund was on the table and would cost more than £200m less than the subsidy offer. But Mr Hutchinson says a subsidy scheme was the only option that was presented to the public. DETI issued a consultation document on the RHI scheme in July 2011, which said that an ongoing subsidy scheme was preferred over an up-front grants fund because it had greater potential as a long-term proposition. Mr Lunny quotes from the document, saying that the subsidy scheme "offers the highest potential renewable heat output at the best value". Mr Lunny says it is known "absolutely clearly" from the final CEPA report on the scheme options "that it did not offer the highest potential of renewable heat output and it certainly wasn't the best value". Mr Hutchinson acknowledges that that was the case. A July 2011 submission to the then DETI minister Mrs Foster about the RHI scheme didn't contain several key details, including the difference in cost between an up-front grants initiative and an ongoing subsidy offer, says Mr Lunny. It also reflects the position that a decision appears to have been taken that a subsidy scheme has been chosen. Attached to the submission was CEPA's report, which included the cost difference figure, but it was a "turgid" and "complicated" 150-page document, says Mr Lunny. Mr Hutchinson says he would've written the first draft and he accepts that the figure and other crucial details should've been "pulled out" for the minister in the submission itself. Mr Hutchinson was unaware in 2011 of the danger that RHI scheme claimants could be overcompensated depending on the amount of time they used their biomass boiler. He says he had "a false kind of understanding that if people were using it more they would be paying more for their fuel bills and that would be 'netting off' the benefit of the subsidy in some regards, which I accept wasn't happening". CEPA's conclusions about which option to pursue for the RHI scheme to pursue have been described by some witnesses as ambiguous, and the inquiry is searching for reasons why that is seen as being the case. Internal emails between senior consultants at CEPA appear to suggest that they were not willing to firmly recommend that DETI go with an ongoing subsidy scheme, which they claimed the department had wanted. CEPA director Mark Cockburn told the inquiry last week that his firm's conclusion was tempered to suit DETI's policy agenda and there was "negotiation" about what would be concluded. Mr Lunny says CEPA was contracted an an independent consultancy, so why were DETI officials having an "input" into how the firm would present its conclusions. Mr Hutchinson says he can't remember any such negotiation but acknowledges there were discussions on the report's contents, although there was no attempt to influence CEPA, or push "them in one direction". Sir Patrick reiterates that there was a "clear indication" from documents the inquiry has seen that DETI had a preference for a subsidy scheme over the grants scheme that CEPA recommended from a cost perspective. Inquiry panel member Dr Keith MacLean says DETI's paper work from the time all seems to refer to the initial £25m cost over the first four years of the RHI scheme. He asks whether the hundreds of millions of pounds of costs shown in CEPA's detailed tables that would follow over the 20-year lifetime of the scheme - referred to as the "tail" - "didn't really register". "I was always aware that it was £25m to 2015 and the tail," replies Mr Hutchinson. He goes on: "Maybe sometimes and maybe too often it was slipped back into: 'Well this is just £25m', and that tail of spending, that 20 years of commitments, might not have been appreciated" by those who were not working on the project. The value-for-money difference between the two options for the RHI scheme is "extraordinary", says Dame Una. She suggests that a value should have been put on the non-cost benefits - the ease of administration, for example - and then weighed against the cost difference between the options before a decision was taken. "We're trying to understand why that wasn't done," she says. Mr Hutchinson says that after the then DETI minister Arlene Foster had "endorsed" a subsidy scheme and it had been backed by respondents in a consultation process there was "momentum" behind it and it was felt that "that is the route that we're taking". "Another [grants fund] didn't seem to be the right policy match at the stage," he adds. Sir Patrick probes for the reasons why DETI favoured the ongoing subsidy model in spite the cost differences. He says he finds it "difficult to understand" why these reasons are not laid out in the business case. He asks why it didn't say: "In terms of cost, the [grants] fund will save £200m, but here are the reasons in terms of policy you might prefer [a subsidy scheme]." "I don't think there was any reason behind it," Mr Hutchinson says. CEPA's final conclusions were that an up-front grants offer would be cheaper over the lifetime of the scheme than an ongoing subsidy offer by more than £200m, and it also meant claimants would have less cost to bear when initially installing their biomass boiler. For a subsidy scheme, the pros included that guaranteed payments over 20 years meant there would be continued use of renewable heat, and it also meant there would be less money for DETI to fork out at the outset of the scheme. The ultimate cost difference between the two options was described as "pretty stark", but CEPA outlined that there were non-cost benefits to consider - the "administrative simplicity" of running a subsidy scheme similar to the Great Britain RHI, for example. Mr Lunny points out that the £200m cost difference is not outlined in the business case that was put forward for the RHI scheme, and he wonders why the other benefits were considered to outweigh a such significant saving. Mr Lunny brings the discussion back CEPA's warning in the June 2011 report about the risk of an incorrect subsidy level being set - either too high or too low. In the first instance the consultants said there is a risk that claimants would be oversubsidised and less heat would be produced per pound, but if the sudsidy were too low, renewable heat would not be deployed to the extent expected. "The normal method of dealing with this risk are regular, planned reviews of subsidy levels after a number of years," Mr Lunny quotes from the report. CEPA recommends a review within two to three years, adding that it notes that an up-front grants scheme is "much less exposed to this risk since subsidy levels are in effect reset each time a call for the bids is made". Mr Lunny points to CEPA's advice that an up-front grant scheme is a much more flexible model and offers "this great ability to learn from one competition to the next". Mr Hutchinson says that ability may have been restricted due to a lack of staff resources at DETI. Mr Lunny asks whether that staff shortage was factored into discussions between DETI and CEPA as a point against adopting a grants fund. He suggests that DETI could have said: "Look, in an ideal world with greater resources this type of approach might be feasible, but it isn't feasible with one-and-a-half staff." Mr Hutchinson says he does not remember that being discussed specifically. It appears that DETI had a preference for a subsidy initiative ahead of an up-front grants scheme before it had received a final report from the consultants, says inquiry chair Sir Patrick Coghlin. A grants scheme was shown to offer far better value for money over a subsidy offer. But Sir Patrick says it's important to remember that settling on what type of scheme to go for wan't just a decision to be taken based on cost figures and it has to be looked in a wider context. That includes the ease of administration of any scheme and a consideration of what the industry was demanding, namely a long-term incentive offer. Inquiry panel member Dame Una O'Brien asks whether there were discussions within DETI's policy team about risks of the a grants fund and the ways those risks could be overcome. Mr Hutchinson says he thinks there would have been a discussion, adding: "It's hard for me sitting here arguing against the challenge fund and arguing for [a subsidy scheme] knowing where we are now. "At the time I think it felt like a logical, rational decision." Dame Una notes there was a lot of discussion that isn't recorded on paper and asks if there was a preference for a subsidy scheme. "There was a preference... at that stage following those discussions," Mr Hutchinson says. He cites previous examples of grant funds, and the desire from industry for a scheme that would offer long-term benefits to claimants. The inquiry's junior counsel Donal Lunny kicks off proceedings by taking today's witness Peter Hutchinson - a civil servant at the Department of Enterprise, Trade and Investment (DETI) when the scheme was set-up and run - back to the final report by consultants in June 2011. CEPA (Cambridge Economic Policy Associates) prepared the economic appraisal that considered options for a renewable heat scheme, including a comparison of a up-front grants-based fund, or an ongoing subsidy scheme of the type that finally emerged. Mr Lunny reminds the witness of DETI official Bernie Brankin's warning that the funding for a renewable heat scheme brought with it a danger that overspend could affect the Northern Ireland block grant. There is no mention of that danger in the CEPA report, so Mr Lunny asks whether DETI had passed on Ms Brankin's warning about the threat. Mr Hutchinson says that CEPA talk about the dangers of overspend in their report "but they didnt talk about what the impact would be". What is the RHI Inquiry? An independent inquiry into the scandal was established in January by the then finance minister Máirtín Ó Muilleoir. He ordered it in the wake of the huge public concern and what was then a developing political crisis surrounding the scheme. The RHI Inquiry began last month and Sir Patrick Coghlin (above), a retired Court of Appeal judge, is its chair and has been given full control over how it will operate. For more information on the RHI Inquiry, you can read our handy Q&A. Public and political anger erupted when the scale of the overspend emerged. The Democratic Unionist Party (DUP) leader Arlene Foster (below) had been the minister in charge of the Stormont department that set up the RHI scheme in 2012, and she faced calls in to stand down as Northern Ireland's first minister in December last year. She refused, and Sinn Féin's Martin McGuinness then quit as deputy first minister in protest at the DUP's handling of what had by then become a full-blown political crisis. By doing so, he brought about the collapse of the Northern Ireland Executive. Now, nearing a full year on from that, Northern Ireland remains without a devolved administration. You can find much more detail on the RHI scheme in our need-to-know guide. The budget of the RHI scheme ran out of control because of critical flaws in the way it was set up. The most recent estimate for the overspend was set at £700m if cost controls are not introduced. Claimants could effectively earn more money the more fuel they burned because the subsidies on offer for renewable fuels were far greater than the cost of the fuels themselves. 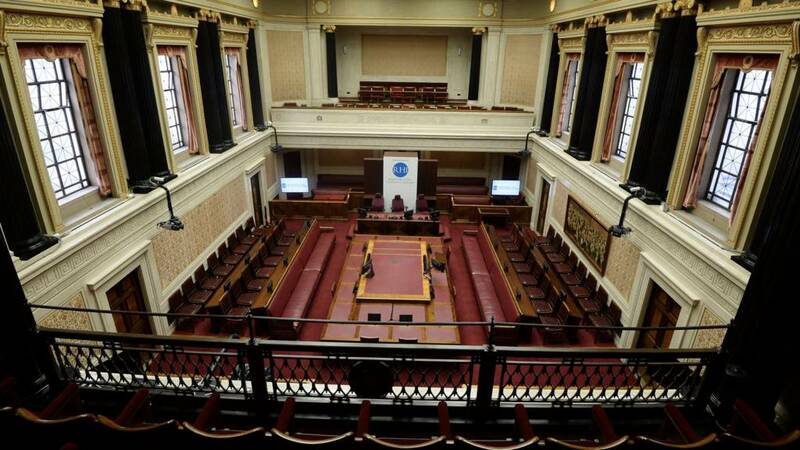 The massive overspend bill will have to be picked up by the Northern Ireland taxpayer. RHI scheme - what was it? The Renewable Heat Incentive scheme - or RHI for short - came to the fore of the Northern Ireland public's minds in autumn last year... and the fallout from the scandal attached to it is still being felt in the region's politics today. The scheme was set up by the Northern Ireland Executive in 2012, as a way of encouraging businesses to switch from using fossil fuels to renewable sources for generating their heat. Those who signed up were offered financial incentives to buy new heating systems, biomass boilers, for example, and the fuel to run them.